Our updated 3/4 pull tested rock and roll bed incorporating our one touch closure system and 5 position reclining. We’re proud to launch the second generation of our very popular Evolution bed, the Smartbed Evolution 2. Our 3/4 width pull tested bed to 76/115/EEC/2005 and with our ease of use operating system and innovative reclining mechanism as standard. 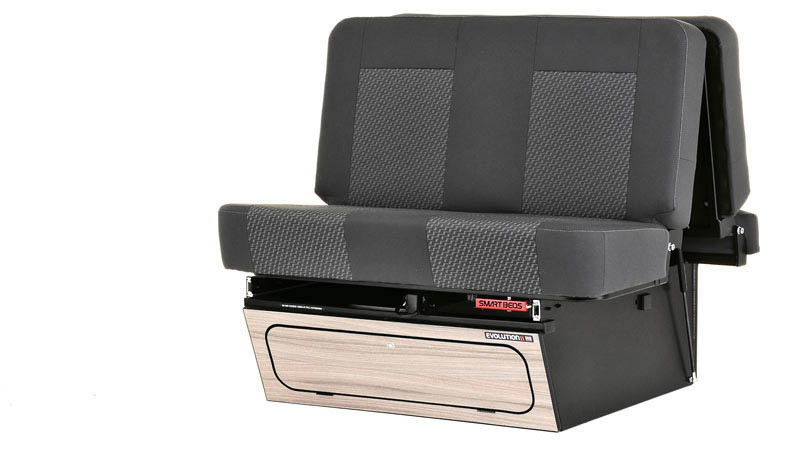 The new Smart Bed Evolution 2 not only has the same ease of use operation as the original but also now has a reclining system to increase passenger comfort. This new innovation was a result of our customer driven development programme, which insures that we stay at the forefront of rock and roll bed design. We pride ourselves on high quality construction, safety and innovative design, which has been the key to the ever growing Smartbeds popularity. Smartbeds, the original and still the best. Accept no imitations. They are out there.